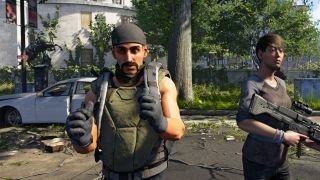 Ubisoft has patched a bug in The Division 2 that's been plaguing players since the weekend. Certain skills—that is, your abilities in the game, like turrets, or the robot bee-spitting hive—were vanishing after deployment, before replenishing in the player's inventory 15 seconds later. It was annoying enough that I mentioned it in my review, and since I'm pretty deep into the endgame's World Tier 4, it was adding an extra layer of challenge to open world activities where I didn't really need any more hassle. Yesterday, Massive dropped in on Reddit to explain that it's been solved, following another brief maintenance period. I've not tried the game since then, treating myself to a couple of days off after giving my every waking hour to the game for a week, but the player response seems positive. It's been clear all weekend that the developers are paying close attention to launch issues with The Division 2, of which there have been a few, from crashes to bugs preventing progress. Remaining issues with this side of the game will apparently be addressed later this week. After 50+ hours, according to the in-game clock, I'm still looking forward to sinking more of my precious remaining life into The Division 2. "A packed, rewarding, and frequently thrilling looter shooter that should have a bright future," was my verdict. Don't miss our guide to the Dark Zone, if you're thinking of jumping in.